Wuerth Elektronik ICS exhibites at Bauma 2019 its CAN-connectable products. They comprise control units, I/O modules, and displays. The ICCS 64P V2 device is based on the HCS12XEQ micro-controller by NXP. It performs logical functions or can be used just as an I/O device. The module can drive loads up to 2 A per output and has more than 30 inputs of different types. It complements host controllers and power boards from Wuerth Elektronik ICS. It can be connected to the printed circuit board and thus enables the control of the entire system, e.g. relay switching and monitoring of the fuse status via CAN. The two CAN interfaces and an optional LIN master interface allow data exchange between independent bus systems. In addition, the device enables gateway/filter functions and the conversion of data from LIN battery management systems or LIN rain/light sensors to CAN networks. 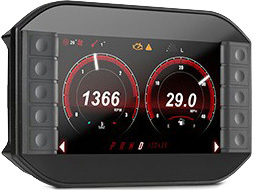 The company presented also its CAN-connectable 7-inch display as at the previous Bauma in 2016. It can be used to visualize, to monitor, or to control all commands or status information – e.g. alarm messages or diagnostics data – transmitted via CAN. The product is available in different versions: with and without programmable buttons, with and without capacitive touch screen, and with and without Wi-Fi and Bluetooth interface. The display can be programmed and configured by means of the Wecabin designer tool. It features dynamic control of widget properties using Java Script and updating of the user interfaces via Ethernet or USB. It supports the SAE J1939 protocols and CAN layer-2 usage. The German company offers also the IP68-rated ICCS CAN I/O modules. Digital information, analog voltages, and currents can be detected as input signals for processing. Two proportional valves can be controlled by pulse width modulated outputs (PWM). The valve current is detected by an integrated current measurement and can be controlled accordingly. Four more proportional outputs are available with a PWM control signal. Via the high side current sensing the output current is fed back.